Last Christmas I promised, on behalf of the Yum Yum Institute (our in-house design collective) to knit Richard a pair of winter mittens. I found the “manly mitts” pattern by Elizabeth Morrison and it has proved to be excellent. Richard can now enjoy toasty paws all winter. 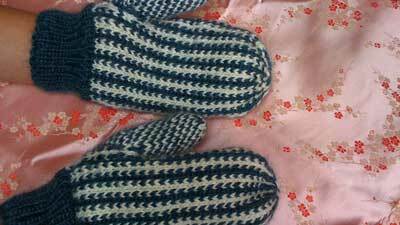 This entry was posted in Knitting and tagged knit, winter, yum-yum. Bookmark the permalink.